[You never know when a bit of radio history will resurface. Eight years ago, A.R.C. published an article by Ed Schneck (July 1990) in which he shared the Cortlandt St. memories of his 91-year- old father H.L. Schenck. At the time, Ed asked Francis Yonker for the photos he had heard were in the Yonker collection. However, Francis could not locate them. Meanwhile, another short piece on the famous "Radio Row" by Alton DuBois appeared in April 1991. But, miraculously the elusive Yonker photos suddenly surfaced, and we're grateful to Francis for telling us about them and sharing this "Photo Essay" with our readers. A second part of this "Saga of the Cortlandt St. Negatives" has to do with their printing. Tim Morse, the photographer who handles our more challenging photography problems, called this one a "real adventure." Although he has worked with negatives as old as the turn of the century, Tim had never encountered any like these, which had been rolled in a cannister, probably since 1950. They were like a coiled spring, almost impossible to lay down, until he subjected them to the weight of a 10-pound dictionary for 10 days. Even then they coiled, but not as tightly, and were so strong that they lifted the negative carrier. As for the quality of the photos, Tim says they are very sharp, but the negatives are what photographers call "thin" --not a lot of detail. They were either underexposed or underdeveloped, and had to be printed on high contrast paper. There are a lot of scratches, causing the white lines on the prints. Remember when the World Trade Center (Twin Towers) wasn't there? 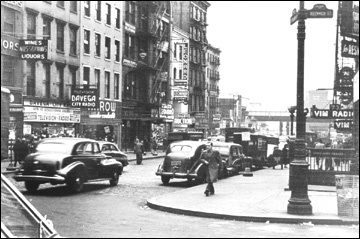 A 5¢ subway ride would take me downtown near the tip of Manhattan to Cortlandt St. [That subway stop is still called "Cortlandt St."] In the early 1930s, Cortlandt St. was known as "Competition Row" and later as "Radio Row." In the early 1940s, I was setting up a radio/sound repair shop, and I needed a set of Supreme instruments, such as a tube tester, an RF and audio oscillator, a 3" oscilloscope, and an RCA Rider Channalyst. For almost anything I needed I could go to 10 or 20 stores on Radio Row looking for the best prices. At that time, car radios had the antennas mounted under the running boards. Antenna kits for insulating a car's bumper for an antenna were common. Frequency modulation was new in broadcasting, and servicemen had to know how to tune the discriminator transformers. High impedance DC vacuum tube voltmeters were just being introduced, so I had to add that to my list. By the way, FM was on the 42 to 50 megacycles band then. Black and white television, just in its infancy with a 3" picture CRT, was broadcast from the Empire State Building only two or three hours a day. Television receivers were being sold on Radio Row, as were all the tubes and parts for any receiver. Radio Row was a shopper's paradise for the hams who built their own transmitters. Parts and equipment galore! World War II brought a halt to television, and ham radio bands were closed down. Times were tough in the marketplace until 1945 when war surplus equipment started to arrive. Many new stores opened up in this area selling military gear at junk prices. The photos included show many radio stores in the early 1950s, as you can judge by the vintage of the cars -- the latest model in the photos is a 1954 Ford. The stores can be identified and located by the front door or sign and street number, and by referring to that position on the street map shown in Figure 6. Cortlandt St. is not alone in this area because Greenwich, Dey, and Liberty Streets also joined in the common theme of competitive radio. Figure 2. 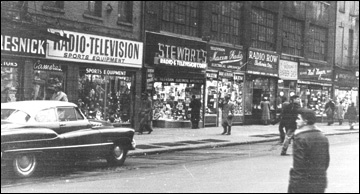 Greenwich Street, showing Lou Resnick selling radio and television along with sports equipment at No. 166 through to Oscar's at No. 176. In between is Stewart's at No. 169, Maxim at No. 170, Radio Row at No.172 and Nat Unget at No.174 1/2. A quick crew cut at the Veteran's Barber Shop, No.174, was available to radio store shoppers. 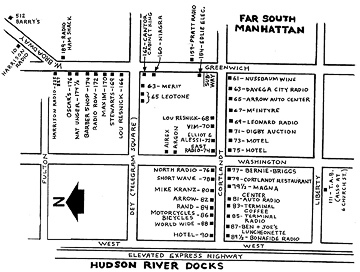 As you walked beyond the immediate Radio Row area north on Greenwich where it joined West Broadway, Harrison Radio was located at #10 West Broadway -- a ham's paradise for equipment. Several subway stops north would place you on Canal St., another long street of surplus supplies covering radio, electrical, plastics, and everything else. 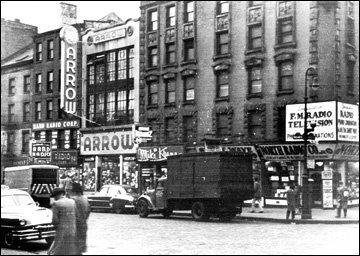 TAB ("That's a Buy"), a surplus store, was at 512 Broadway and 6 Church St. Grand Central Radio was at 45th St. near Madison, and there were several other stores at 14th St. around Union Sq., Packard, etc. Figure 3. The corner of Cortlandt and Greenwich showing Davega at No. 63, Arrow (only "row" shows on sign) at No. 65, Lennard Radio at No. 69, and Digby Auction at No. 71. In the distance is the elevated highway along the Hudson River. The odd side of the street continues on the following page. Figure 4. Continuing along Cortlandt, we find Bernie Briggs at No. 77; the area of the photo with the Cortlandt Restaurant next door at No. 79 is damaged; Magna and Center Electronics Co. Auto Radios are at Nos. 79 1/2 and 81. Figure 5. Working our way along the even side of Cortlandt, starting across the street from Ben and Joe's Luncheonette, is Rand Radio at No. 84. Arrow is next door at No. 82 and Mike Kranz and Short Wave Radio are at No. 80 and No. 78 (both are behind the truck.) On the corner of Washington St. is North Radio at No. 76. At this time, I was employed by RCA Radiomarine in the Holland Plaza Building at 75 Varick St., located between the Holland Tunnel Exit and entrances at Canal St. I was installing radio equipment on the USS United States docked on the Hudson River. 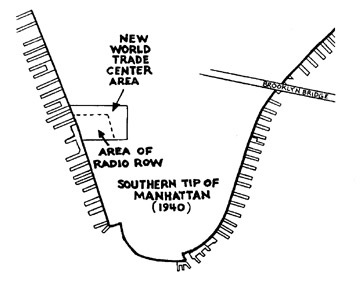 When the World Trade Center came along around 1970, its property lines started at Vesey St. on the north to Liberty St. on the south, Trinity Place on the east and the elevated highway on the west. This project obliterated Radio Row, as well as the most progressive businesses scattered all over Manhattan as far north as 45th St. Figure 6. Street map of "Radio Row" in lower Manhattan showing the business locations. Anyone having more photos, negatives, information or corrections is welcome to contact me and A.R.C. Francis Yonker's radio history goes back to 1929 when he had a home-brew regenerative radio on his bike and a RCA Radiola III on his sled. As a Naval officer in World War II, he attended courses at Bowdoin College and M.I.T. specializing in radar and countermeasures. He has retired twice: once from Penn State, his alma mater, after 22 years of teaching and having built TV Channel 3 Education, Station WPSX; and again in 1991 as a full professor after 20 more years in radio and TV. Copyright © 1996 by John V. Terrey - For personal use only.